A hammer to the head! There really is no better living actor than Joaquin Phoenix. It’s not really news to anyone, but the man’s versatility is on a consistent up-and-up. An actor of immense vulnerability, Phoenix is perhaps an ideal pairing for the likes of Lynne Ramsay, a director whose entire catalogue shares the lowest common denominator of psychological evaluations. 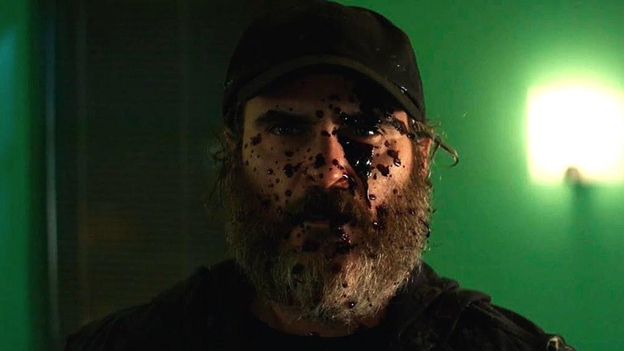 YOU WERE NEVER REALLY HERE is Ramsay at her most cataclysmic, a pulsating heart attack of a film. Anxiety-ridden and unflinching, Ramsay explores the internality of a genre that’s oftentimes purely external. 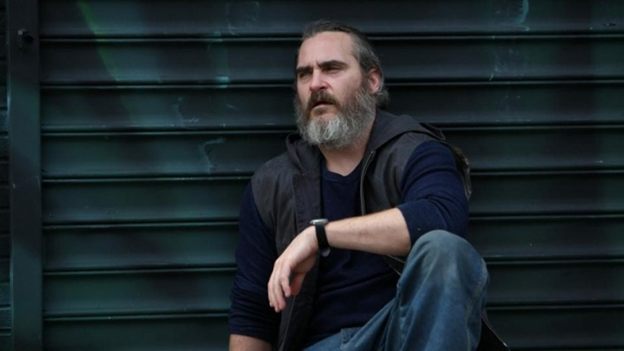 Tracing the mental degradation of a hired assassin’s kinship he forms with a young girl, YOU WERE NEVER REALLY HERE is TAXI DRIVER on the surface and DRIVE in stylization. It’s a film that carries many of Refn’s formal tendencies—its digital nighttime photography and pulsating synth score even harkening back to last year’s GOOD TIME—utilizing Cronenberg-esque hyper-violence to explore the psychology of its key player. Ramsay is patently disinterested in the where’s and how’s of the film’s detective work, oftentimes entirely omitting information, blurring details, and obfuscating data. It’s TAKEN told by the world’s least reliable narrator. It is because of this that Joaquin Phoenix really gets a chance to really shine. Ramsay opts out of providing clear answers, allowing her audience to infer countless components of her protagonist’s backstory, closing her film before we receive any clear-cut conclusions. It’s a visceral experience, one rendered absolutely devastating through Phoenix’s sharp, dead-eyed gaze, constantly two steps ahead of us. Vulnerable and carnivorous all at once, Phoenix’s performance showcases organized crime in a light that cinema so often ignores: rugged, unglamorous, and rough around the edges. It does to Manhattan what Michael Mann’s MIAMI VICE did to Florida. It’s something Ramsay seems to occupy a lot of time with. YOU WERE NEVER REALLY HERE is an unashamed auteurist subversion of gangster tropes. Much like her lead character, Ramsay is always a step ahead of her viewer, duping us whenever we’re certain of what’s to follow. A sequence that could have easily opted for a Neeson-esque torture scene is instead reduced to the humanity of suffering, its villain instantly surrendering information, quietly wheezing as he dies from his gunshot wounds, only to be accompanied in song by a mourning Phoenix. It’s a blissful moment of cinema, one that is heightened by Ramsay’s keen eye and one of Johnny Greenwood’s finest scores to date (an arguably pointless assessment seeing as Greenwood is constantly one-upping himself). Blunt force trauma, YOU WERE NEVER REALLY HERE is a rapturously transgressive genre picture, a film that can find a welcome entry in the new wave of digital American cinema—right beside GOOD TIME, SPRING BREAKERS, and DRIVE. Anchored by an against-type Phoenix, Ramsay continues to prove her worth as a sculptor of the world’s most recognizable faces. Effortless craftsmanship allows YOU WERE NEVER REALLY HERE to ride a wave so kinetic, so unapologetically different, that it ruptures every fiber of your body—never feeling inclined to elucidate its protagonist’s trauma, but merely observing it.